At Enspire, I managed many large, complex projects for an array of clients. These were primarily online courses that incorporated cutting-edge web technologies, game mechanics, beautiful design, compelling written content, and professionally-produced audio and video. My role on these projects was to serve as the primary point of contact for clients, facilitate communication within the internal team, and ensure that work remained on schedule and within budget. I accomplished this using JIRA, Basecamp, Gantt charts, spreadsheets, etc. Below are a number of screenshots from two completed courses that I managed. Both featured HTML5 canvas animations, tablet compatibility, API integrations, Section 508 accessibility, and an iterative development process. 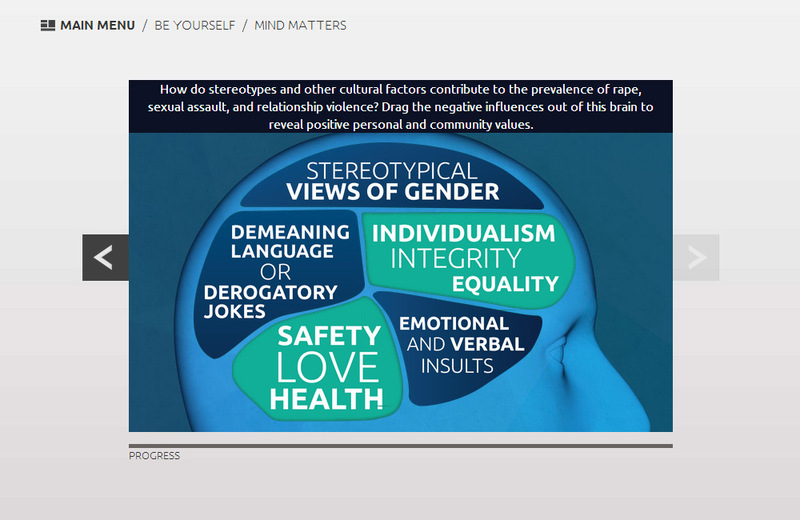 The main menu of an online course about sexual assault (for college students). 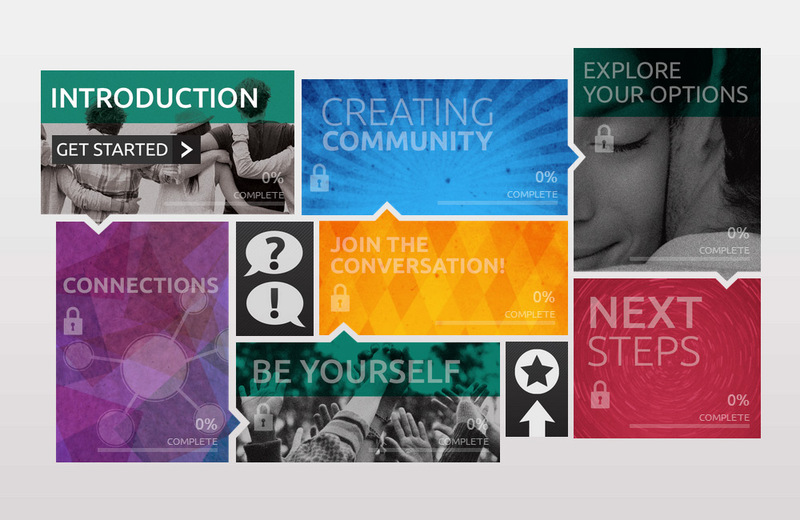 Each section is unlocked as students complete the previous chapter. Screenshot from an intro video heavy on motion graphics. 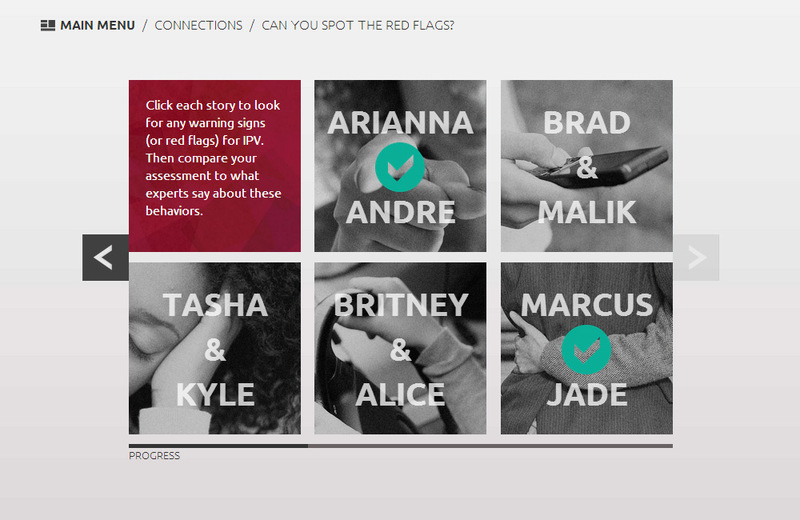 A hotspot activity that allows the user to explore gender stereotypes in a visually engaging format. 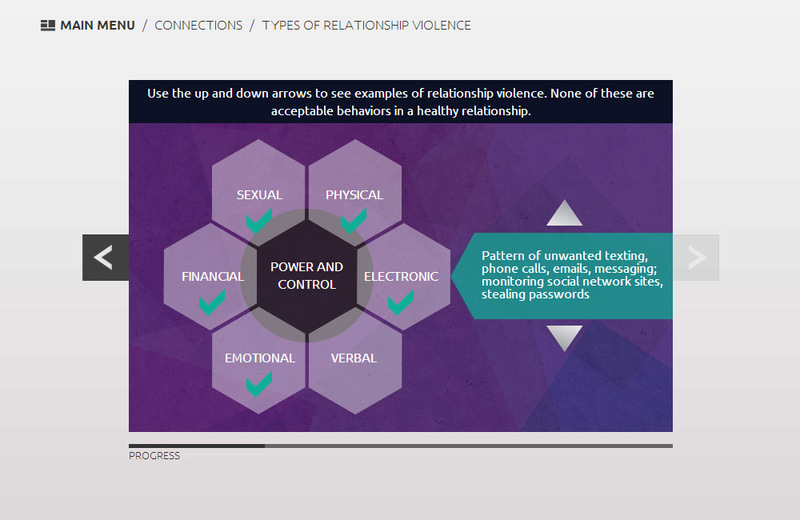 The first screen of a branching activity about the warning signs of intimate partner violence. 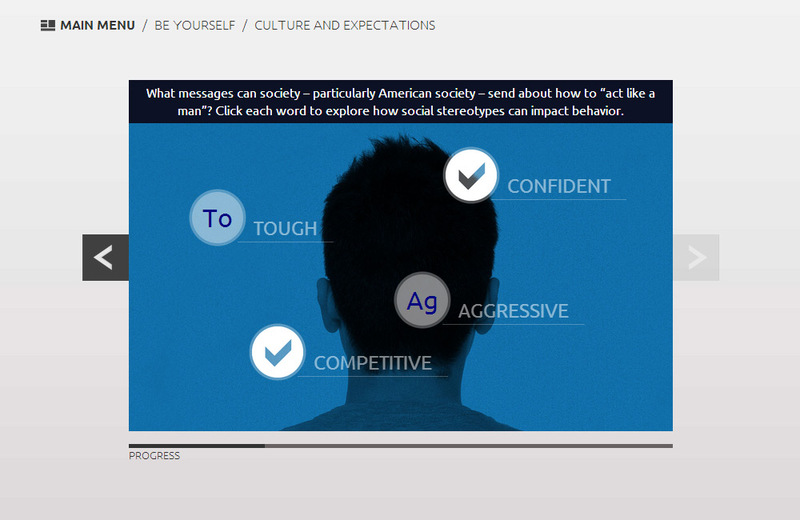 A multiple choice question presented with flat, icon-heavy imagery evoking modern web and mobile apps (to better connect with the target demographic). Another activity where users engage in a unique interaction (spinning a wheel to reveal information). A submenu showing sections within a specific chapter of the course. An activity where users drag away blocks of text to reveal new information. An infographic that provides users with data in a graphically rich form. A meme-like image designed to be shared on social media and spur discussion outside of the course. 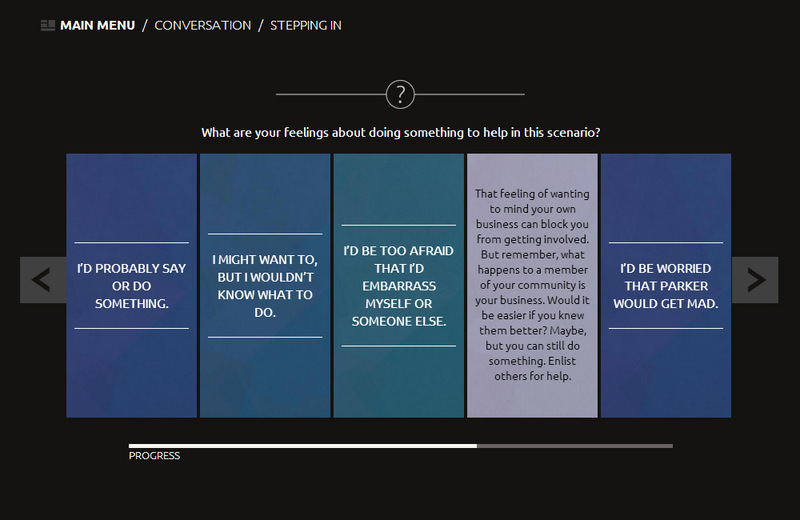 The beginning of a multi-step activity designed to teach bystander intervention. This screen includes a cinemagraph with subtle looping movements that bring the scene alive. 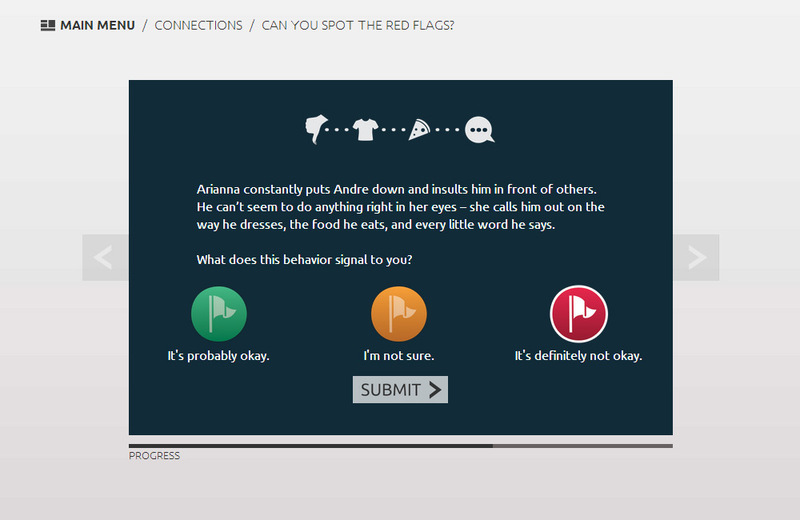 A multiple choice activity where users choose which scene in the story made them uncomfortable. Multiple choice question where users choose how they would have intervened to prevent an assault. 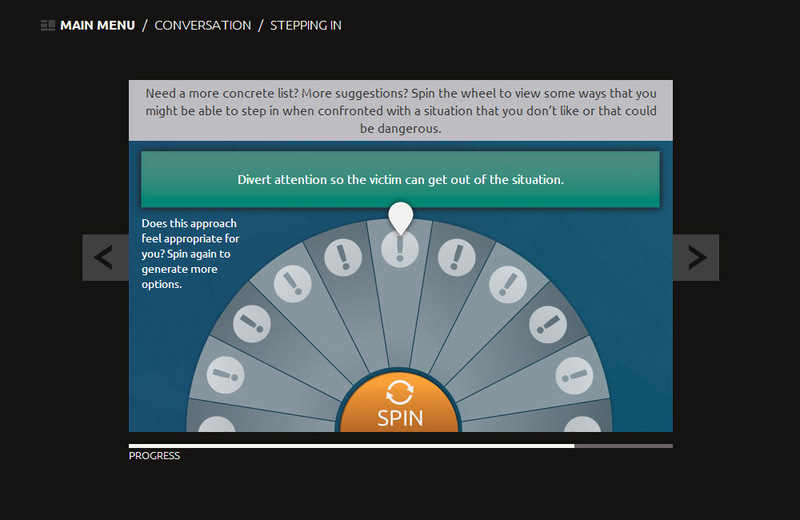 On this screen, users spin a wheel to get ideas for intervention. The game-show feel is intended to bring humor and approachability to the topic. 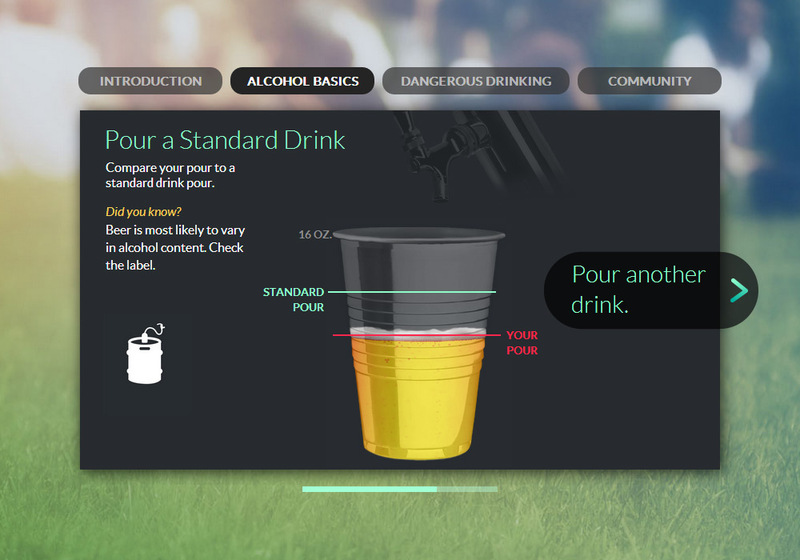 Intro video for a course designed to teach college students about safe drinking habits. 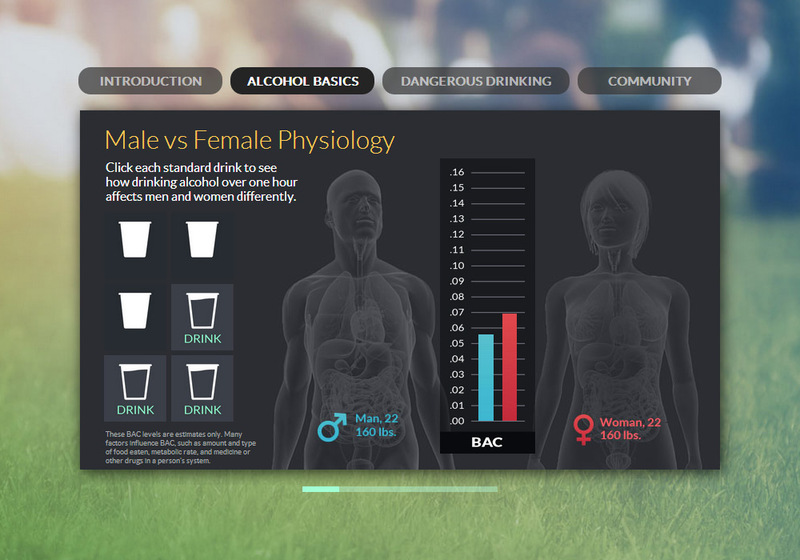 Activity where users see a visual representation of the effects on blood alcohol level for men vs. women. 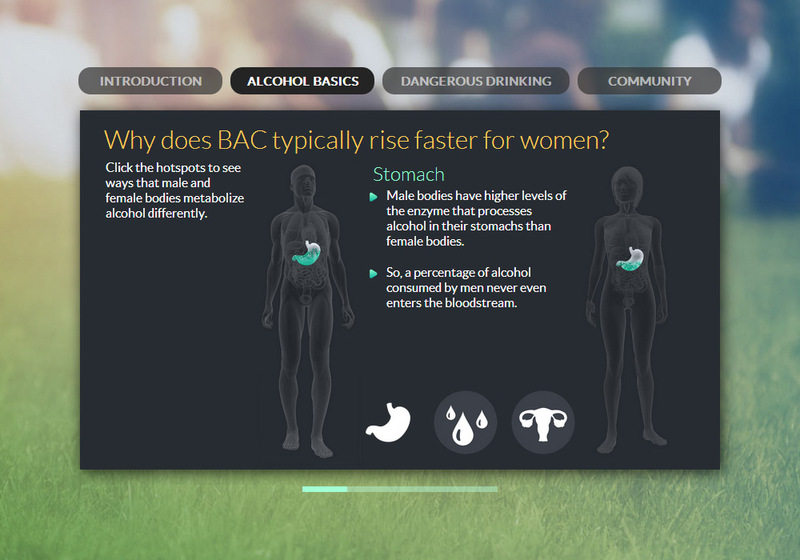 This activity explains why BAC rises faster for women than for men. 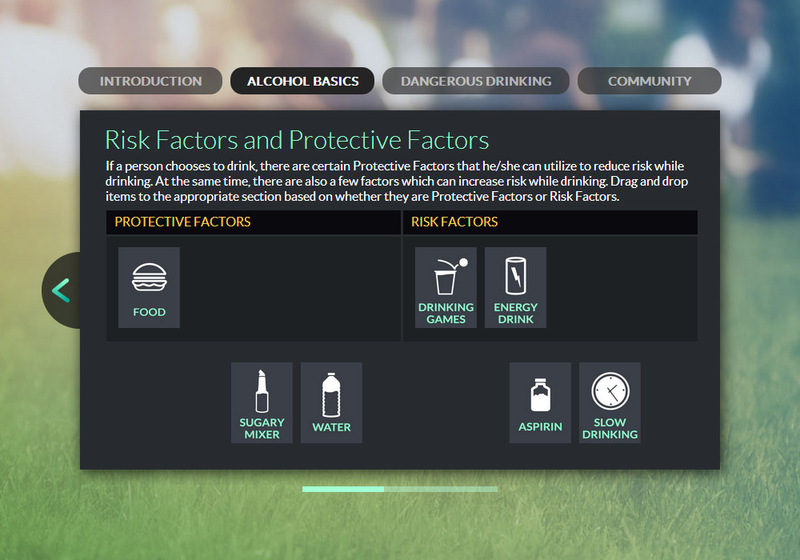 Here users drag items into two categories (to teach risk factors vs. protective factors when drinking). 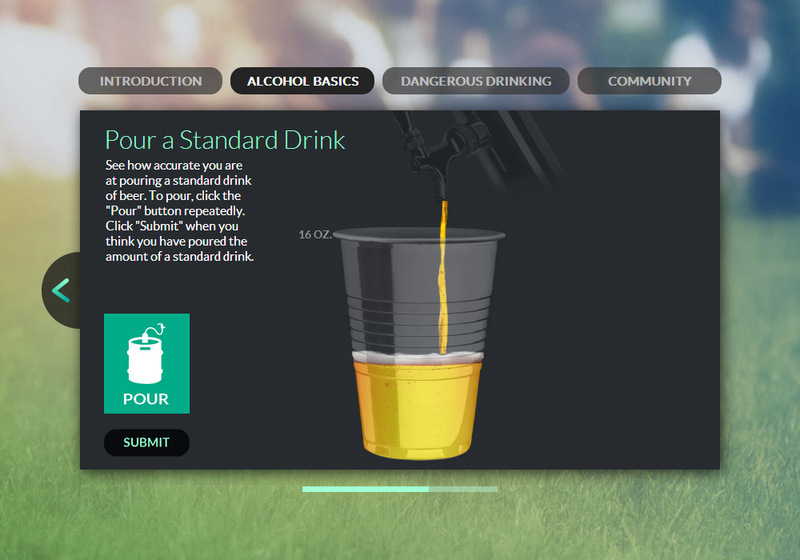 In this activity, users click the "pour" button until they think the cup is at the level of a "standard drink". Next the user is shown how their pour compares to an actual standard drink. This activity is repeated for wine and liquor. 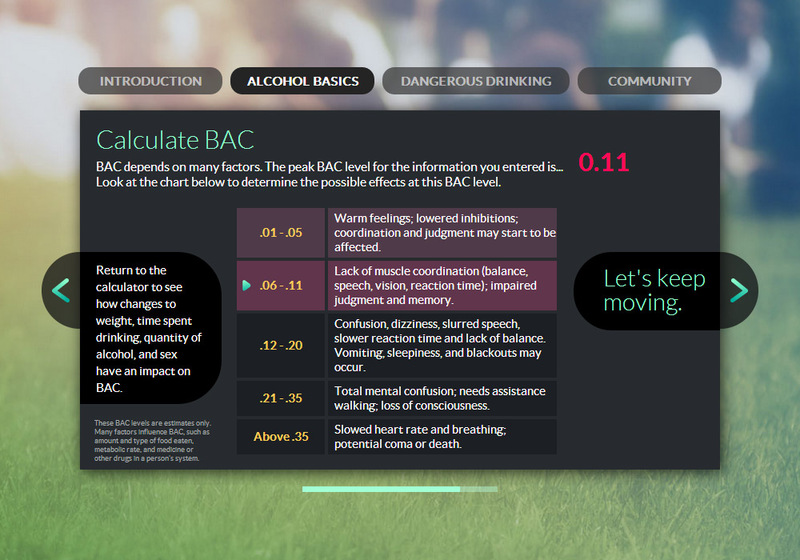 Here users can calculate their BAC level based on factors like weight, time spent drinking, number of drinks, etc. 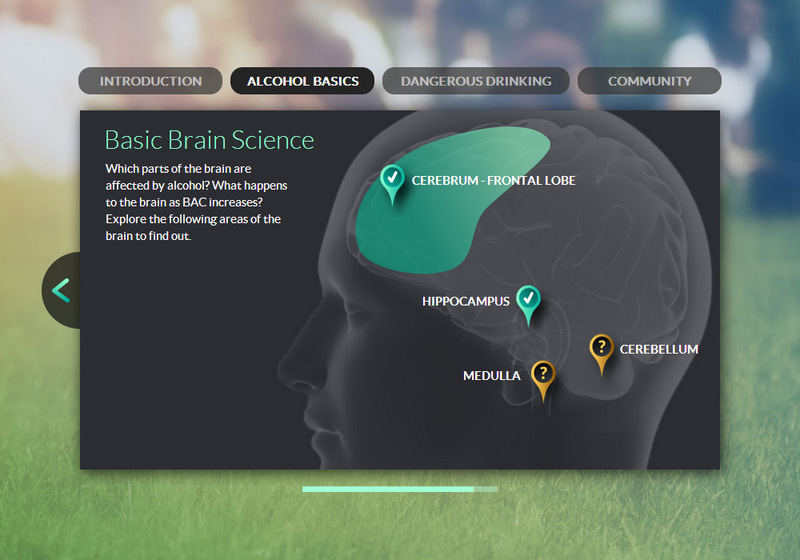 This hotspot activity lets students see how alcohol affects various parts of the brain. This is the info shown when users select various brain regions in the preceding screenshot. 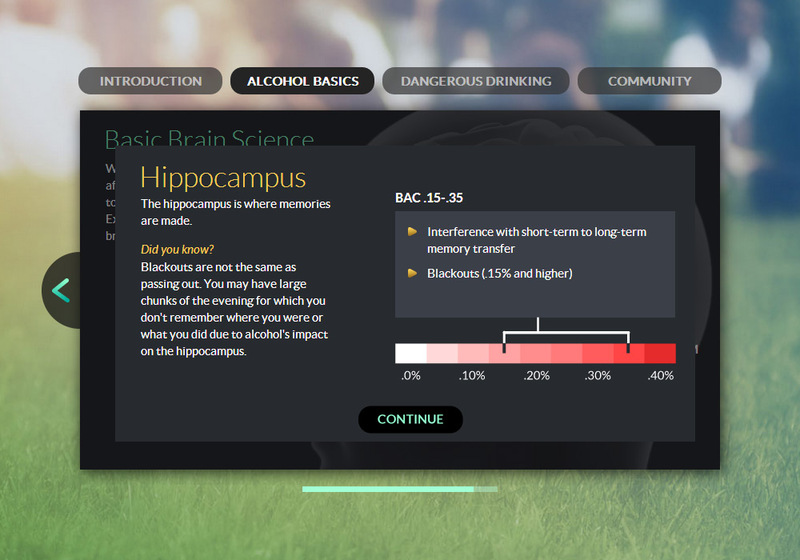 In this activity, users watch video clips of a fellow student getting progressively more intoxicated and decide when to seek help. At EnviroMedia, I oversaw a range of digital marketing initiatives for various clients. This included websites, banner ads, analytics reports, online courses, and much more. As the sole full-time employee in the interactive department, I was responsible for the digital aspects of every campaign the agency tackled during my tenure. I managed a team that included contractors, part-timers, and shared resources in the execution of many ambitious projects. Tools like JIRA and Asana were instrumental in helping me create, assign, prioritize, clarify, and track issues. I also frequently used Gantt charts and spreadsheets to establish timelines and budgets. Below are a number of screenshots from some of the projects I organized. 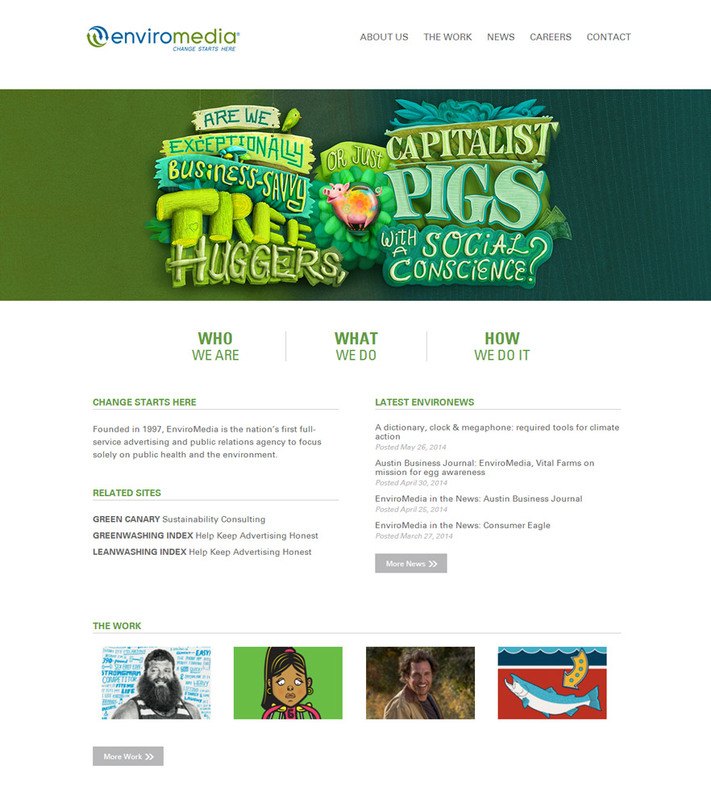 Home page of the EnviroMedia website. I led the project to redesign and rebuild the site, which was terribly outdated and broken. A page in the "About" section. The entire site is mobile responsive and built on a custom WordPress theme (based on the Bootstrap framework). 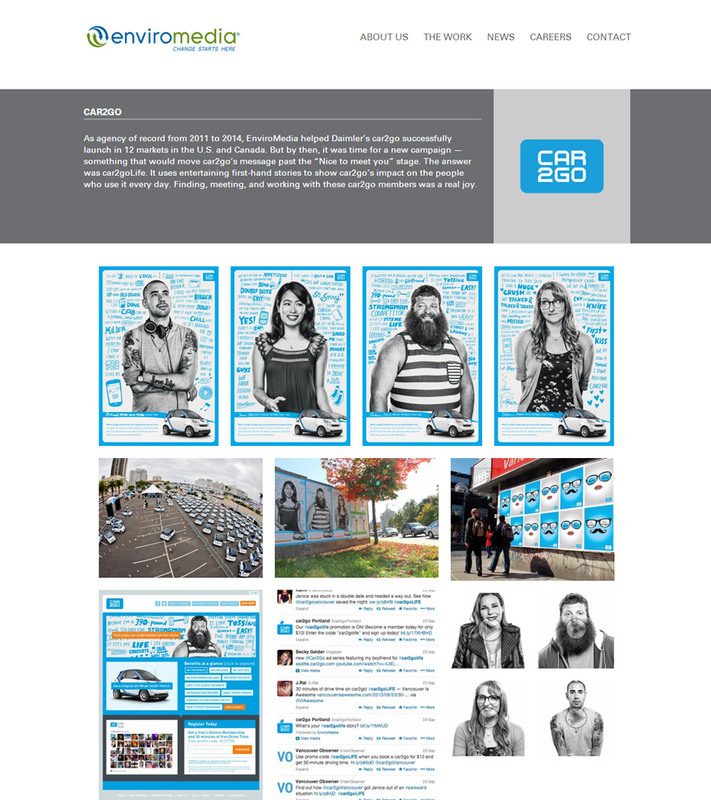 The main page of the portfolio section. 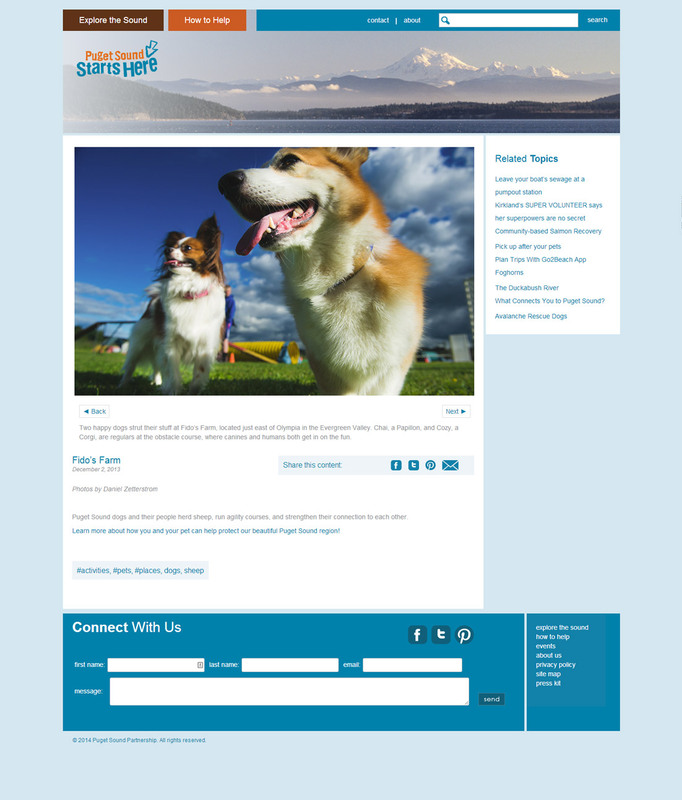 We used custom post types, custom fields, and various WordPress plug-ins to execute the unique page layouts. 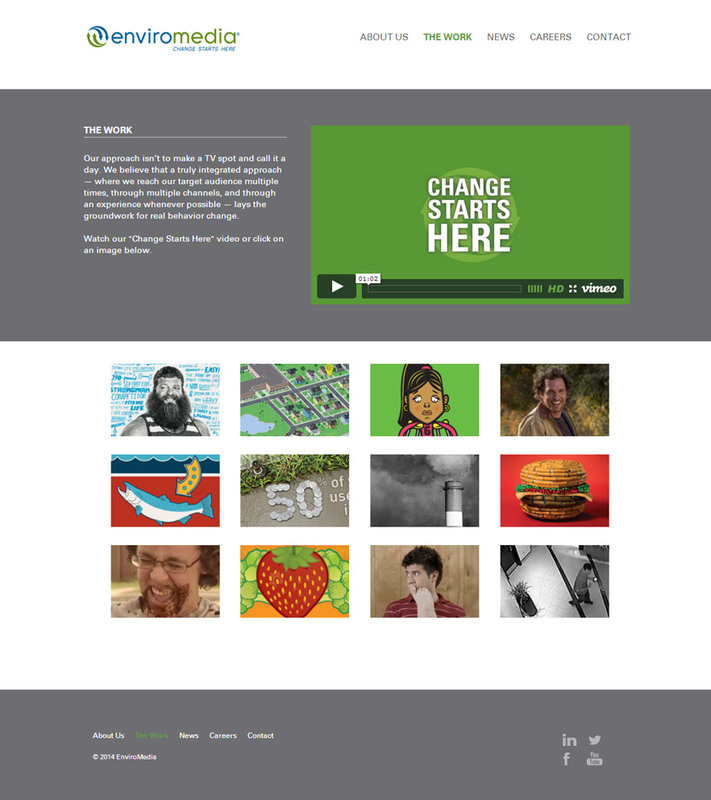 An individual project page within the portfolio section. 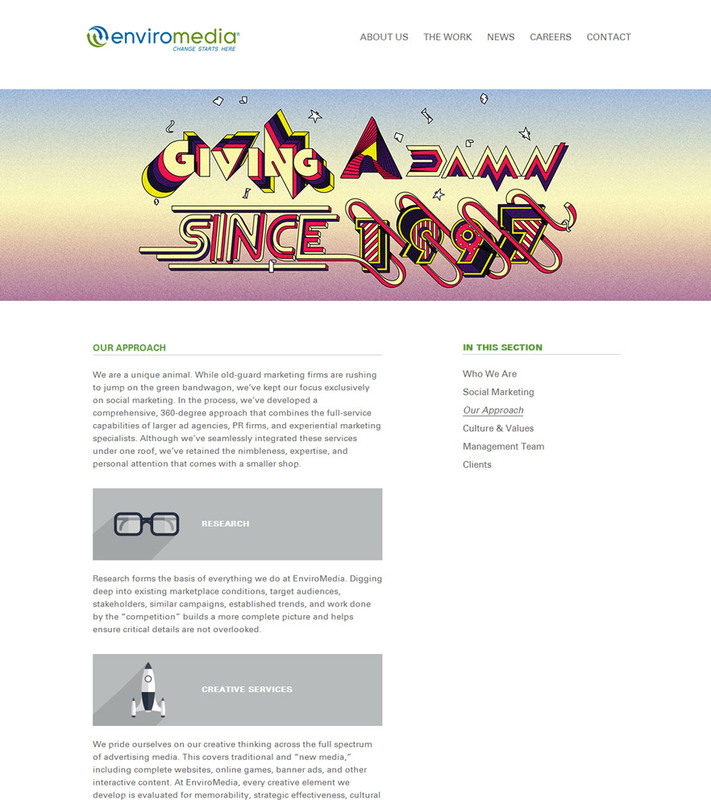 I oversaw the process of gathering, formatting, organizing, and posting all the old portfolio materials. A lightbox window on an individual portfolio page. This allows the user to see each piece of collateral in more detail. The blog section of the site. We imported hundreds of blog posts from the old site and reformatted them for proper display on the new one. 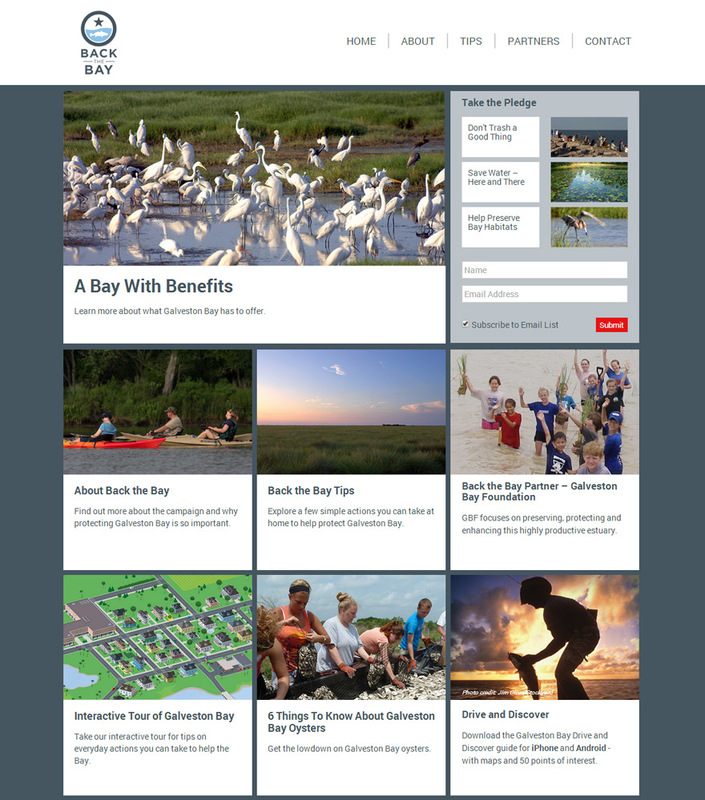 Home page of a site we created for the Galveston Bay Estuary Program. I oversaw the design, implementation, and launch. An individual article page. 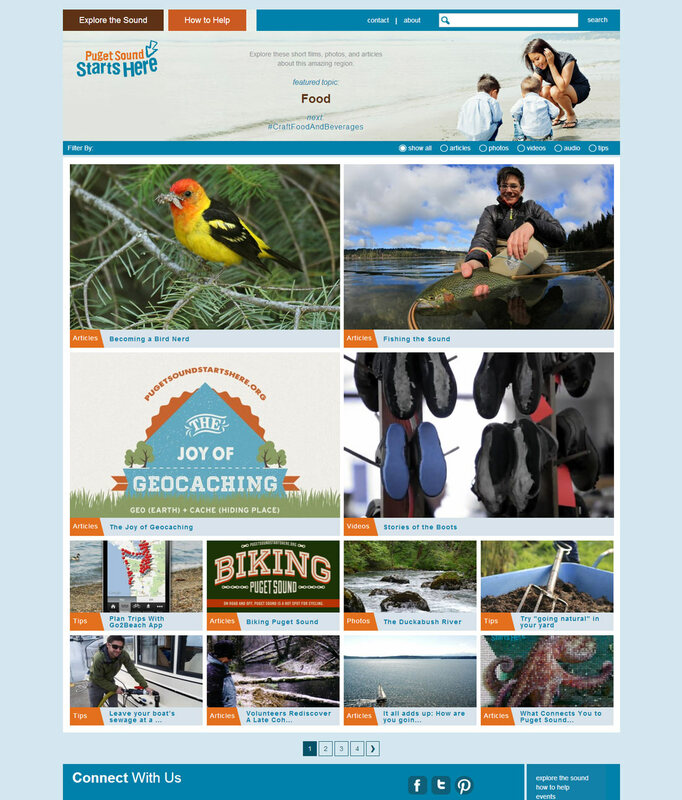 The entire site is mobile responsive and built in WordPress (using a fully custom theme). Partners page featuring various logos. 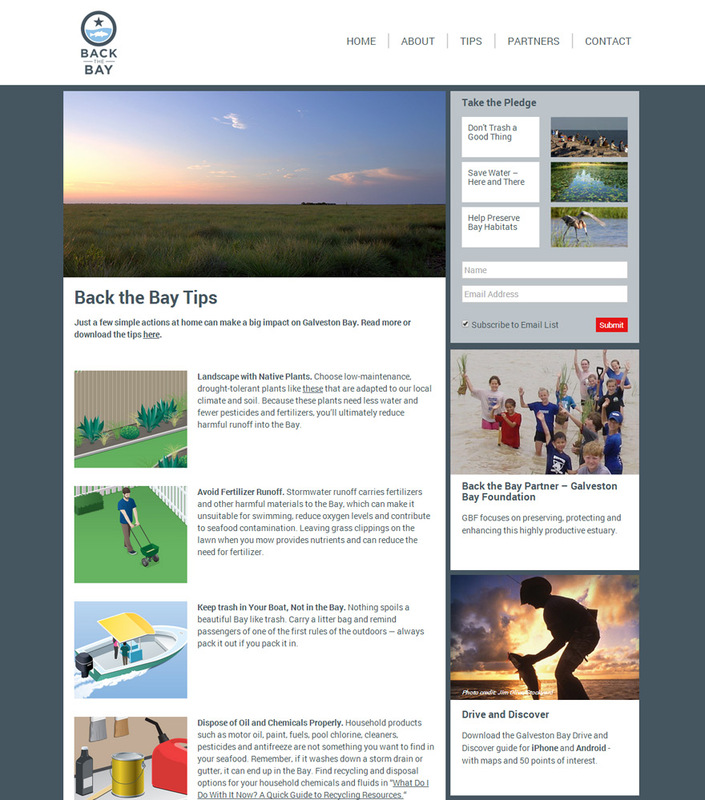 The site uses modern content marketing techniques to inform residents of Southeast Texas about the bay. 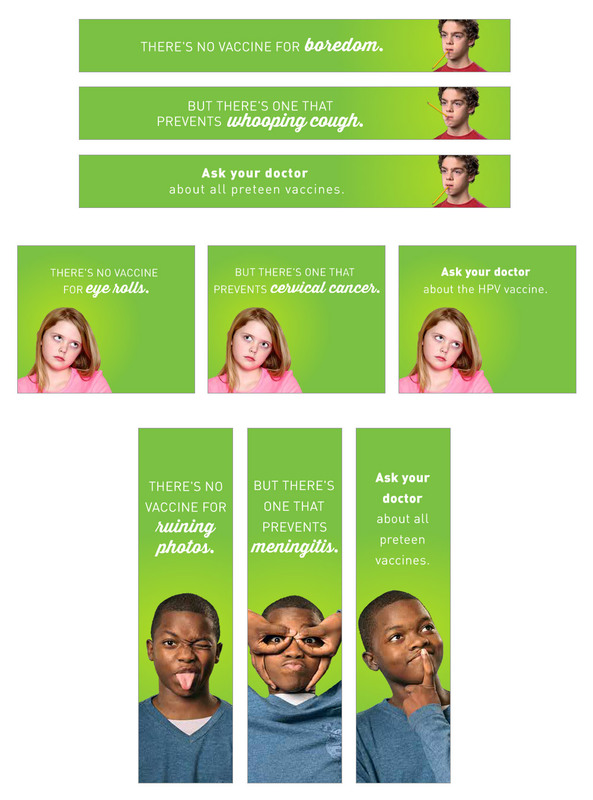 Stills from animated banners promoting pre-teen vaccines. I oversaw the production of approximately 20 banners for this campaign. 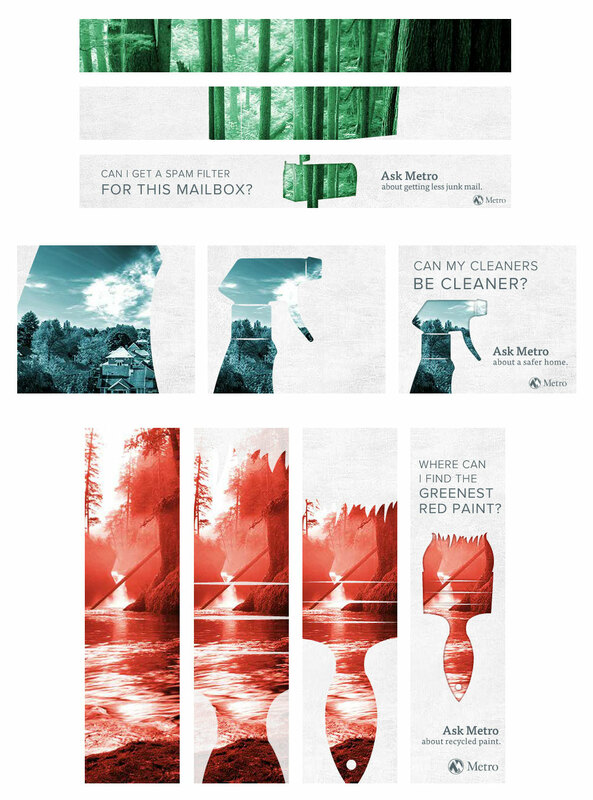 Stills from animated banners promoting outreach by the Oregon Metro regional govt. This campaign featured 30 banners. 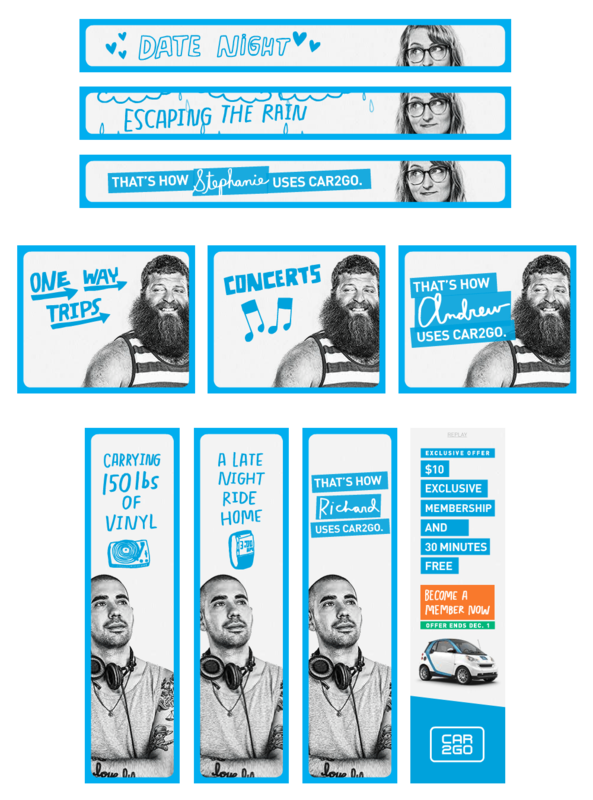 Stills from animated banners created for car2go. I oversaw the production of roughly 20 banners for this campaign. 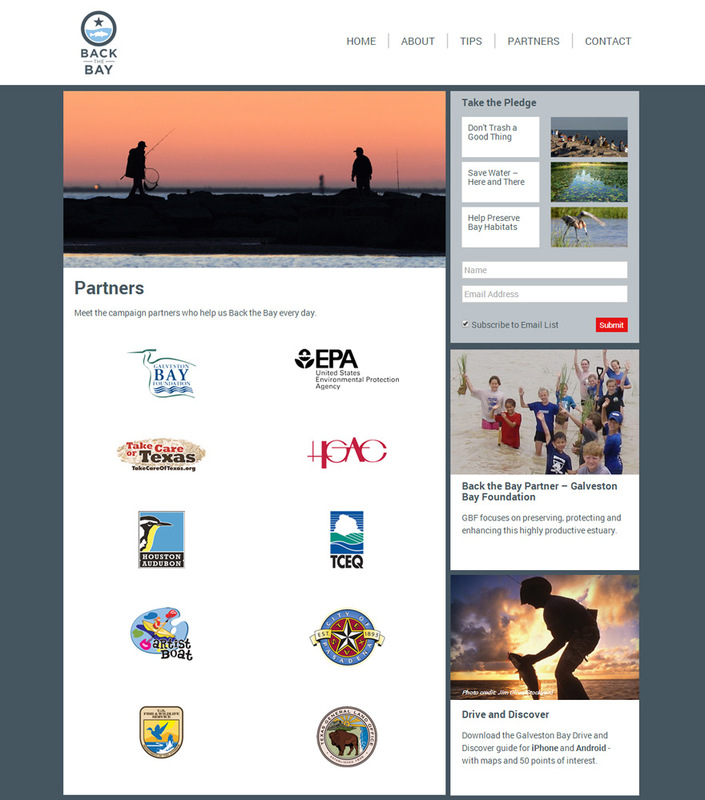 Stills from banners promoting awareness of Galveston Bay environmental issues. These used photos from a shoot with a chalk artist. 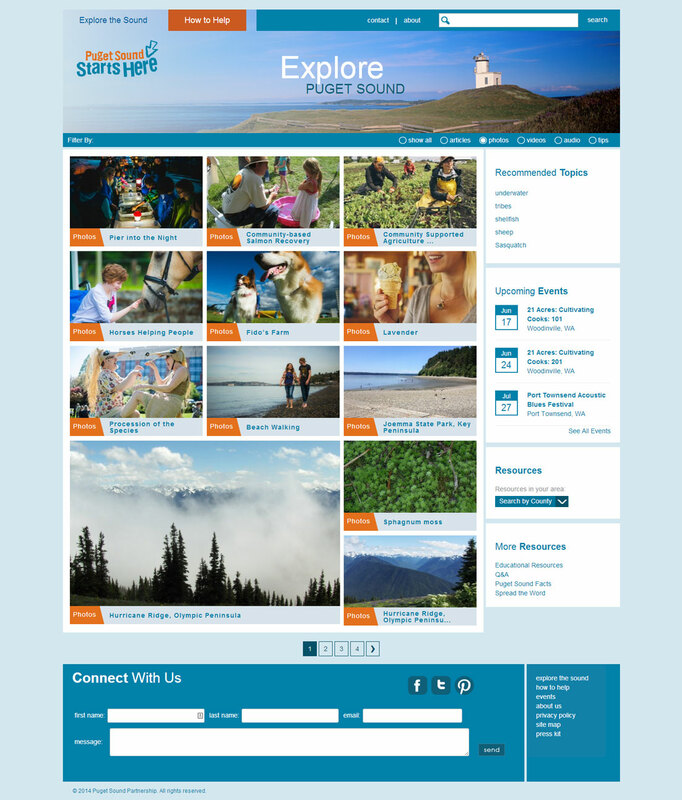 Home page of a website created for the Puget Sound Partnership. I oversaw numerous content updates and maintenance tasks on this site. Main page of the photos section. 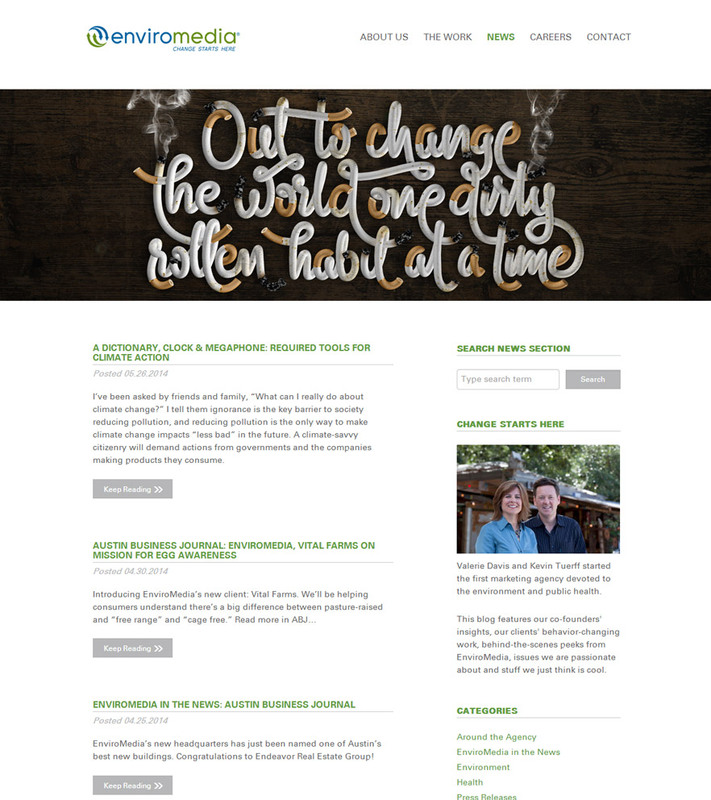 The site was built in WordPress using a custom theme. An individual article page. 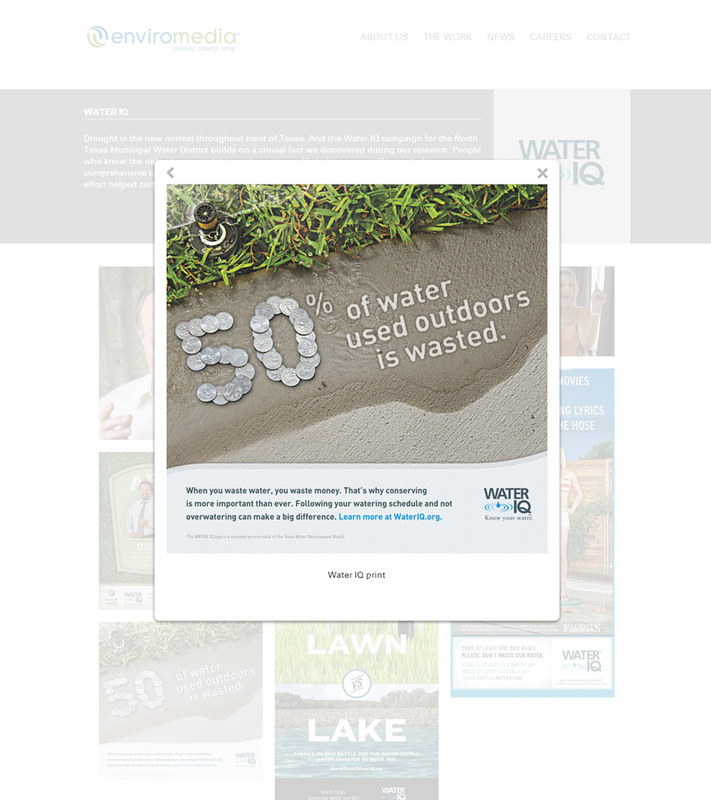 Similar to the Galveston Bay site, this one uses content marketing to promote its message of environmental preservation. 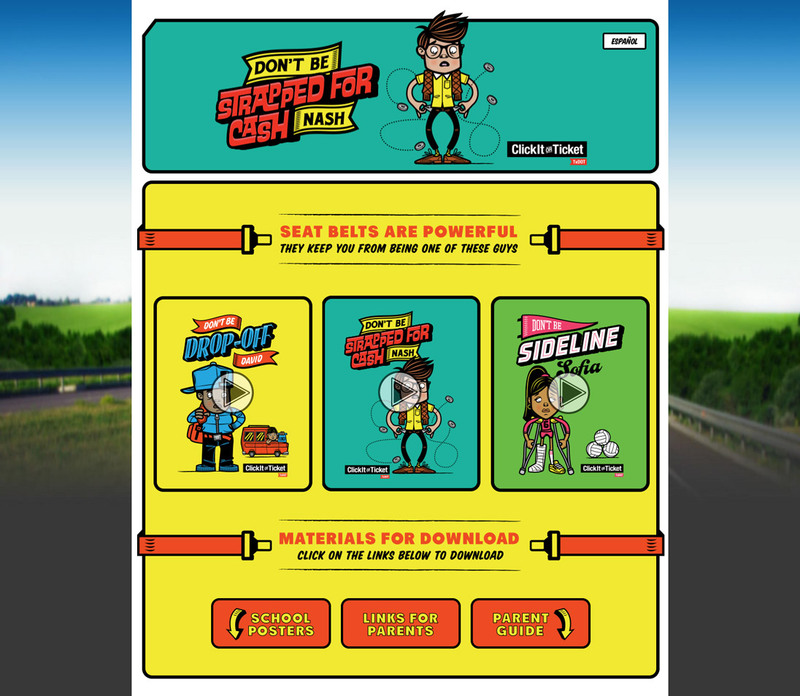 Main page of a microsite created to promote the use of seatbelts by teens. I oversaw implementation of the site (built directly in HTML/CSS with no CMS). 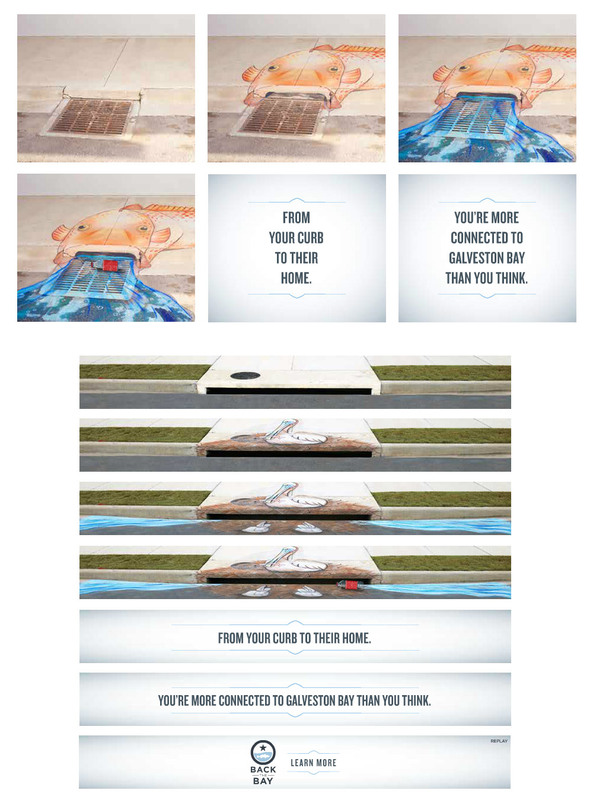 A lightbox showing a Vine video created for this campaign. 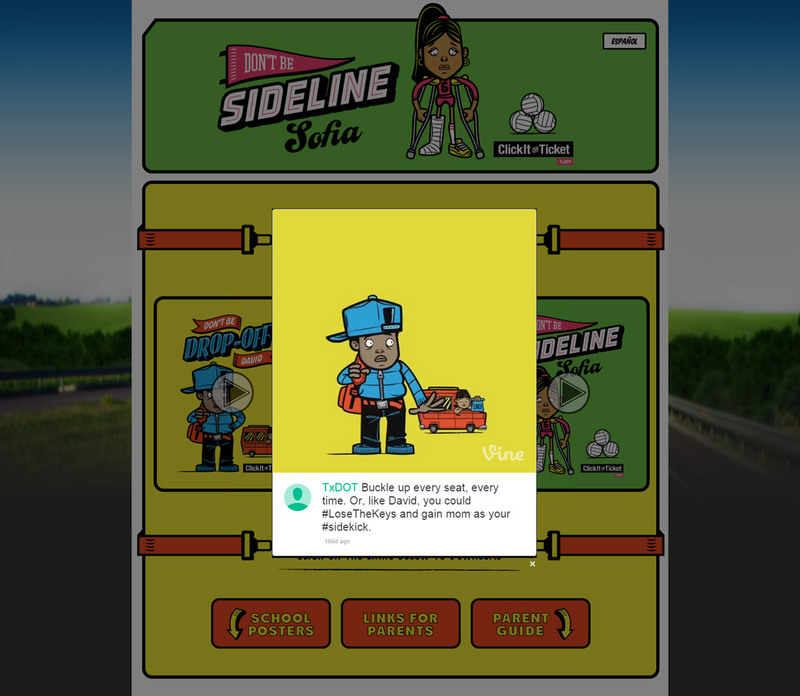 I assisted with the process of posting the animations to Vine, which required numerous workarounds. In addition to my professional experience, I also studied project management as part of earning my MBA in Digital Media Management at St. Edward’s University. In our Project Management class, we examined both traditional and agile methodologies in detail, and completed several major group projects to test our understanding of these topics. 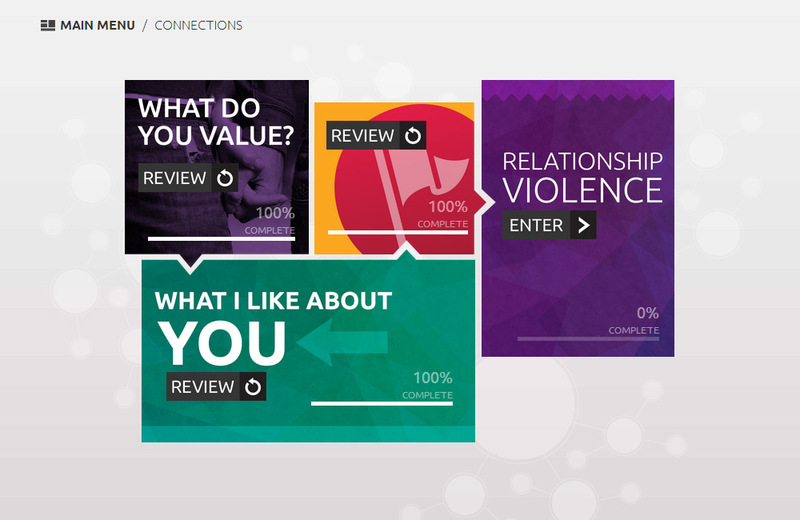 You can find a sampling of my coursework in the MBA Projects section of my portfolio.